January 23, 2017, 11:40 a.m. Originating in the Victoria era as the breakfast of the wealthy, the Full English became more and more popular until the 1950s, at which point roughly half of British people consumed a cooked breakfast. Now new YouGov research examines what the ideal Full English breakfast looks like. (Please note, as the Full Scottish, Full Welsh and Full Ulster are all distinct national variations of the full breakfast, this survey was conducted in England only). 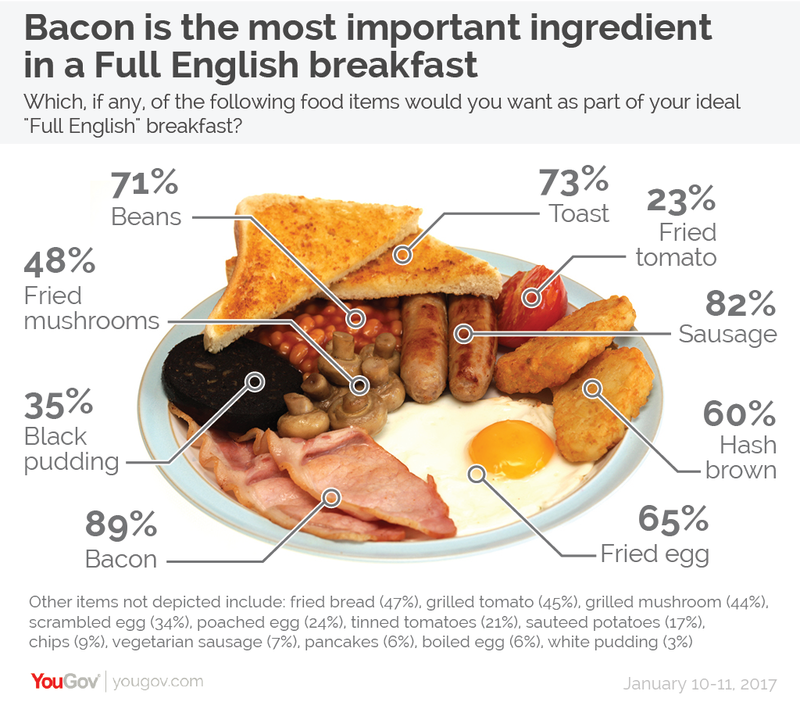 The single most important part of a Full English breakfast is bacon, with 89% of English people saying it would feature on the plate for their ideal Full English. The survey identifies the core ingredients in a decent Full English, with six food items identified by more than half of people as being essential to their ideal breakfast. As well as bacon, these include sausage (82%), toast (73%), beans (71%), fried egg (65%) and hash brown (60%). Men and women have somewhat different tastes when it comes to their ideal Full English, with men tending to like the less healthy options more than women, and vice versa. Generally speaking, when compared to women, men were more likely to prefer any breakfast components that begin with the word “fried” (bread, egg, tomato, mushrooms) as well as baked beans. Women, by contrast, tend to like items beginning with the word “grilled” (mushroom, tomato) and poached eggs more than men do. But the breakfast item that divides the two sexes most of all is the black pudding. The food, the ingredients for which famously include blood, would feature in 47% of men’s ideal Full Englishes, compared to just 24% of women’s. Differences between the generations are also noticeable. For instance, England’s youngest people (those aged 18-24) are far more likely to prefer scrambled eggs than their elders (and to a lesser extent boiled eggs). They are subsequently less likely to want fried egg. Mushrooms become a less popular choice the younger people are, as does black pudding, and bacon is less popular among 18-34 year olds than with those aged 35+. Even if it is consumed with less regularity than at its peak in the 1950s, the Full English is still a highly popular dish. As many as 83% of English people said that they like a Full English (with more than half saying they like it a lot), compared to just 15% who don’t like them.